The subject of Manners Mall has not yet, it seems, gone away. The Council is still to hear oral submissions on Manners Mall, and one strong anti-abolition-of-Mall campaigner, Maria van der Meel, feels so strongly about it that she has set up a competition for Wellingtonians on that universal medium: Facebook. The City is Ours has announced it is running a design competition for the Manners Mall Open Space starting on the 1st of September 2009 on Facebook. The design must have a feature and reflect the heart of the City where people meet, greet, sit, watch, rest, lobby, busk, ponder and shop. The design also welcomes skateboards and bicycles. The aim of the competition is to make Manners Mall “the focus” of Wellington and a central point for tourists to find their bearings while they take in blue-sky in a traffic free environment. The theme for the design is “Relax your in Manners Mall” The City is Ours is seeking cooperation from the retailers on or near Manners Mall to display these designs so Wellingtonians can view them.The City is Ours will present these entries to WCC at oral submissions in December. Details for the competiton will be made available closer to the time and all entries must be in by 30th of September 2009. Go Facebook Save Manners Mall. 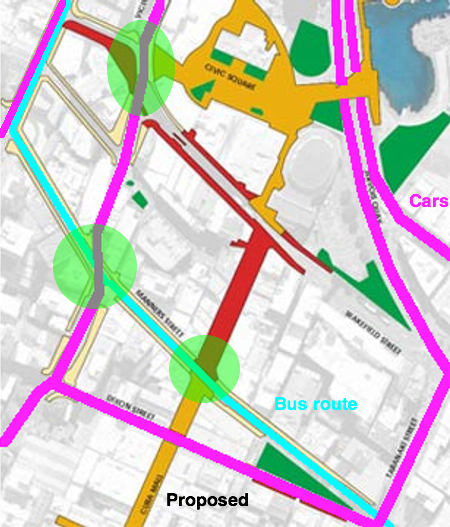 And here is the proposed plan as published so far: with our interpretation of the likely car and bus routes marked on. I’ve circled the major pedestrian / car intersections in green: these are going to be the (quite literally) crunch points. You’ll notice that there are more green ‘crunch’ spots on the After proposal than there are on the Before. That’s because at present, there is an almost uninterrupted pedestrian walkway from the top of Cuba, right down to Willis St. That’s an almost unheard of pedestrian bonus for a city – that for the most part, pedestrians do not have to fight with traffic for right of way. It’s what makes Willis St and Lambton Quay so successful in terms of market rent – the highest in the country, much better than Queen St in Auckland. But so it is also the area that HMA need to get right – the intersections are crucial. I’m picking that the design will need to keep cars and trucks out of Manners St where they exist at present. The design will also need to give decent pedestrian priority to the crossing points marked in green, and reduce that tendency of cars and buses to charge on through. It’s a hard road picking the perfect city. Maximus, I think you’re being a little disingenuous with the Before and After crunch points. At present the conflict between vehicle and pedestrian traffic is not limited to the Manners/Victoria intersection. The abrupt end of Manners Mall sees pedestrians dissipate not only at that intersection but also down that length of Victoria St towards the Council buildings, as pedestrians play chicken with the traffic in order to get to Willis St. The Wakefield/Victoria intersection isn’t mentioned as a pedestrian traffic crunch point, which it certainly is. The After crunch points are not all equal. At present, all vehicles must stop for foot traffic to broach the Manners/Victoria intersection. I expect that crunch to gradually ease, if for no other reason that pedestrians will cross when the buses traverse Victoria St. Similarly, the Cuba/Manners crunch point is overstated. Being bus only lanes through Manners Mall, pedestrians will be relatively unimpeded compared with the Dixon/Cuba crunch (which will always exist unless some timing of the lights favours the foot traffic). I agree that the Civic Square to Willis St crunch will be an issue, as not only Cuba pedestrians but Waterfront ones will converge there. This can be mitigated if vehicular traffic is removed from that stubby thoroughfare, perhaps moved to Bond St. That would present a more streamlined level of traffic. You’d only have the one way Victoria St vehicles vs. pedestrians, and not the current three way choreography. yes, you’re probably right – it is a very unscientific green blobbing on my behalf, But my point is that at present we (pedestrians) have realtively few major crunch points with cars: its really just the bad Cuba / Ghuznee intersection, the Manners / Victoria intersection, and the Willis / Manners intersection. Of those, with out a doubt the Manners / Victoria intersection is the real death trap. That’s why I have only shaded that in green. With the new situation, there will be more cross-overs, and so more potential points for death by bus. Not to be sneezed at I would have thought. Love the graphics! Although as a pedestrian that walks to and from work through that area, it seems you’re downplaying the current problem intersection at Cuba and Wakefield, which is a source of long delays for pedestrians, particularly in the evening. Although it’s also a source of considerable entertainment as you’re waiting for the lights – the continual red light running is very amusing. Particularly when many of the offenders have “Go Wellington” written on the sides of their vehicle .. Although with the buses gone from Wakefield to Manners that should not be an issue any more…. Will there be any need for traffic in Wakefield St? Why not pedestrianise that as well as Cuba ? You’re right about Cuba/Ghuznee. Ever since Ghuznee went both ways, I prefer to take my chances at Victoria/Ghuznee. It may be wider, but at least you can see them coming. As for death by bus, that yellow paint job was the best thing. Always hated that stealthy green Milo bus that zooms along Glenmore St camouflaged against the Botanical Gardens. It’s all very well wanting Cuba to be a shared zone with a 10km/h speed limit, but it’s another to enforce it. Anyone here see the buses (and most other Wellingtonians) following the 30km/h limit along Willis and Lambton? Can’t work out why the Council has such a fixation about pedestrian/motorist separation and speed limits. International research seems to trend toward doing away with city and suburban speed limit signs, giving primacy to pedestrians, using creative environmental speed controls (not more b____y speed bumps), developing improved public transport modes and leaving motorists to contend with waiting in traffic as a logical consequence of the decision to use a car. I find myself disturbed by the AA’s assertion of legal enforceability. In the nearly 8 years of living in NZ, I’ve developed an impression that drivers here don’t drive to respect the law or to respect safety. Drivers limit themselves to what they think they can get away with. Why should a driver be focused on a speedometer instead of the pedestrian? Just give way to pedestrians in a shared pedestrian/vehicle space – simple. However, this focus on enforceability serves only to criminalise the pedestrian and justify the driver. As such, I blame AA and NZTA as much as the drivers. Personally, I would rather avoid the parking on Lower Cuba, and by all means, don’t try to merge that traffic in with buses back onto Manners St – that is where pedestrians would be most at risk. However, council is depending on the parking revenue for partial funding, so we’re going to see it happen, and we’re going to need to see a culture shift with the drivers or the AA will prove to be correct. I can’t really figure out why the WCC are still proposing to install carparks in Cuba (lower) at all. There is a perfectly good system already working in Cuba (upper) – ie without any cars, just delivery vehicles snaking their way through. Why not just replicate that and drop the cars? perhaps what is needed is a speed restriction system like they have in teh pitlanes at Formula 1. The cars are electronically limited to the same low speed. Once out of the pits they can unleash hell. … ….Much the same as the average petrolhead elsewhere in Wellington. Abby, you’re right. At this point the *sensible* thing to do is just completely close lower Cuba St into a proper mall, and turn Manners St into a bus-only route. Initially the plan was for an overall increase in carparks from what we currently have. My suspicion is that this was to get the (albeit limited) parking revenue and to appease potential complaints from those retailers who think (rightly or wrongly) that carparks are key to their livelihood. 1. Simply a hang-over from that initial planning for more carparks that they can’t shake. 2. That they want to allow private vehicles through Manners St east, and to do this it requires that private traffic be allowed through lower Cuba St as well. The alternative would be for Manners St east to become bus-only (which would seem sensible given the projects intentions to improve bus movement). 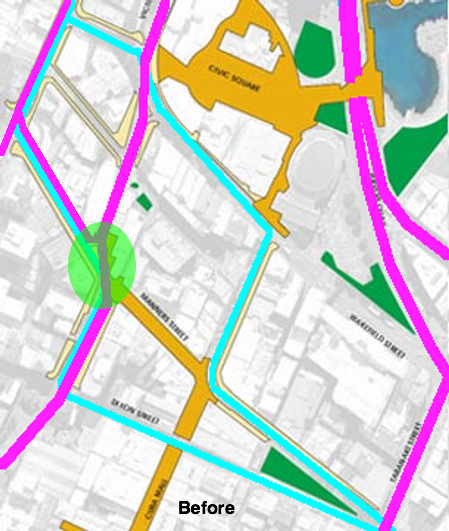 On your (webtastically fantastical) map labelled ‘Proposed’ you show Manners St as being turquoise ie Bus only, and Dixon as being a hideous shade of pink ie presumably Cars only. – do you know if that is correct? or are cars going to be going some places where only buses are shown on your map, and then of course there is the question – where are bicycles going? extent in Wellington, mainly due to geography. trucks, trains, and ships (Sandra Bullock ignored this to her detriment). Street, which is like Wellington’s traffic switchboard. As a side note, I love the attitude held by suburbanites that the CBD should be a commuter’s paradise, but that no way should people be allowed to drive through, or worse, park in their suburb. The CBD is a neighbourhood, too. I used to work in Miramar, and would park my car on the street just down the road from the shops and regularly returned to find notes on my car, and was once phoned by police to ensure I wasn’t a suspicious character parking in their neighourhood. My neighbourhood is the area between Taranaki and Willis Street, and it is essentially three major commuter thoroughfares, but if I dare to suggest that Council ‘lower the speed limit’ or ‘cut the number of lanes to 2’ people are in disbelief. Heading from West/North to East/South, you have a choice of Ghuznee, Vivian, Jervois/Cable, and again Ghuznee is a half option because the Taranaki switchboard will reroute you to either Vivian or Cable Street. Wow, this post really got away from me… BULLDOZE MANNERS MALL! BRING BACK BUSES :) is all I wanted to say. Sorry – copied and pasted from notepad. No idea what happened with the word wrap! The enforecability issue is an interesting one … leaving aside the AA’s comments about speedos not working down to 10 km/hr, there is apparently no structured Police enforcement in the CBD, according to Snr Sgt Richard Hocking. So even if some muppet in his WRX (and it’s inevitably a he, and inevitably a WRX) is gunning it through the mixed pedestrian/vehicle area whilst listening to the doof-doof noises from his stereo, he’s unlikely to be fingered by the constabulary unless an officer happens to be wandering past on other business. I would have thought that an enforcement plan might be a good idea given the prevalence of crashes in the CBD, but apparently the Police devote the majority of their time to patrolling the motorways instead. Personally, if I was an officer with a traffic quota to meet I’d spend ten minutes standing on the Willis/Boulcott/Manners corner grabbing all the red light runners …. but that’s just me. I would love to see some practical traffic enforcement. Parking is well covered – maybe overdone – but there is nothing to slow down the constant flow of moving violations. That would solve the enforceability problem, too. An officer could stop someone for dangerous driving as opposed to speeding. We’ve completely hijacked the topic from the design competition toward traffic and driving habits. I’d still like to make a comment about the changes around Manners Mall. While it’s great to see that the discussion has moved from emotive arguments toward something more practical, I still believe that the Save Manners Mall campaign is far too tightly focused. I am hoping for the bus lanes to be installed because of what effects it will have on urban growth further along the city. Rather than focusing on one area, I’d like to discuss the impacts on the surrounding areas. I expect to see a close relationship between fixing the transport route and the redevelopment of Adelaide Road, for instance. I think that benefit to the greater city is much more important than Manners Mall. I am seriously confused about the intent of this competition. If manners mall is such a valuable location, why are they then launching a competition to remake it? Why are they advocating for the complete erasure and reformation of something which is supposedly so worthy of preservation at the moment? If they are concerned about the loss of pedestrian space in the city; then that’s great. I fully agree. I think it’s asking a bit much for coherence from a local political movement. Some affected store owners are on record as against the plan because it will take away car parks. One shop owner on the Eastern non-mall part of Manners Street said that the bus noise would scare away customers. Apparently, he was unaware that he was already on a bus route, and that many customers probably caught the bus into town! Dis-organized local pressure group they may be, but I love it that they have erected their own “I love Manners Mall” banner on one of the commercial poster sites! Thus, as Manners all is pretty crap in terms of design quality (except as a pedestrian transit space), poorly maintained and the rest of it, I have no real problem over its demise. A replacement pedestrian mall on lower Cuba really isn’t going to work unless there is considerable investment in creating a legible and high quality pedestrian environment between it and the Willis/Lambton part of the Golden Mile – especially given how the city’s retail environment is rather established along its current path. That pinched exit from Civic Sq. between the Town Hall and the Fowl House certainly isn’t up to it, and I just don’t think that Civic Square itself currently has the vitality to be that route. While this is a chance to integrate the Sq into the Golden Mile at last, without demolishing either the Town Hall or MFC, and introducing greater mixed use into the environment, there really doesn’t seem to be much point. Which of course leaves the Mercer/Wakefield route (which seems to be indicated above), which, lets face it, is currently pretty average. This would take some time before the natural urban processes caught up to support any ‘design’ effort to create a pleasant environment that provides a successful replacement link in the Golden Mile. Welcome back M-D, nice to see you posting again. Of course, you’re right in saying that Manners is pretty crap in terms of design quality – it really is terrible. But I think you have overlooked the point of the lower Cuba upgrade. I’m convinced that it is part of a plan to get Welligtonians connecting to the sea and to the Civic Square much more, although the pinch point between the MFC and the Town Hall is a major stumbling block. If they really want it to work, they need to have more going on in Civic Square – some shops in which to buy lunch at the very least, and vast tracts of outdoor seating and restaurants as well unless they want it to remain moribund. Maxi – the design proposal doesn’t support your position – it clearly appears to be addressing the Golden Mile ratehr than the Te Aro-Waterfront connection. Not that I disagree with your desire however, as I expressed above – Civic Sq could be so much better utilised… we might need to rip open a few heritage facades to achieve this, but we shouldn’t let those heritage lobbyists get in the way of good urban design (again)…. I think it will definitely take bold moves to redirect such an established urban route, I don’t think what is being offered, or even the simple alternative of an extension of Cuba Mall, is going to achieve this. The city will simply become less legible as a result of said interventions. A bold move might be to slice the MFC-side edge off the Town Hall (it’s just offices and loos isn’t it?, and aside from the actual auditorium, a bit of a dog of a building in its current form anyway) and make a proper entry to the square there. Then have each of the buildings that surround the square actually open into the square in a much more publicly active and permeable way – including the gallery… Consider pedestrianisation of Mercer Street (or at least a redesign to make it the obvious legible continuation of the Golden Mile, and have much greater priority for pedestrians at the Victoria and Wakefield entries/exits to the Square (which are the real weak points of any plan to include Civic Sq in the Golden Mile. I should add that my proposal above would have much more opposition from a maudlin and sentimental public (dare their cheese be moved! )than the current WCC proposal, and would be quite expensive to boot. It is an interesting point – where is the famed “Golden Mile” meant to run to, and from – and where might it run to / via in the future. At present, clearly (to the City planners at least), it runs down Lambton and down Willis. Unclearly (to the wandering public / tourist at least), it then zips through Manners St, through Manners Mall also, doesn’t quite leap up Cuba St despite the temptation, and then somehow reconnects to Courtenay Place at Taranaki, whence it continues to the Embassy and dies, violently, in a massive Harley pile-up, outside the Deluxe. Presumably the Manners Mall redevelopment is meant to clear all that up some how. I believe the Council want a nice coherent path for tourists and shoppers to follow. Presumably, they want the tourist to wander through Manners, along with the buses. They’ll probably look at similar paving aka “follow the yellow brick road” for the Golden Mile to visually signal the ‘main’ route. However, the new route pedestrianised and enhanced along lower Cuba and along Wakefield will bugger all that up. No doubt top architects and urban designers are working on it as we speak. just in from the Dom today is this little beauty: someone stuffed up ! An $11.1 million plan to rip up Manners Mall and turn it into a bus-only road has hit a snag � the bus lanes will have to be wider and the footpaths narrower than those first proposed by Wellington City Council. Opponents say the footpaths may have to be even narrower yet to accommodate bus wing mirrors, though the council says that is untrue. The hiccup has opponents of the plan requesting that the council extend the public consultation period. Council documents previously released state that the two-way bus lane would be six metres wide, with footpaths on either side spanning five metres. However, the council’s urban development and transport director, Greg Campbell, now says the bus lanes would be 6.5m wide, with footpaths reduced to 4.75m. “If you are being picky, then the figures in the consultation document aren’t exact, but it is not designed as a construction planning document,” he said. But Richard Tingey, from Levin, said the misleading information was a serious oversight. But Mr Campbell said the figures used by the council were “indicative” and the consultation period should close as scheduled on Friday. Abrakebabra restaurant manager Stewart Zaya was “really disappointed” with the entire project. The Manners Mall area, between Cuba and Victoria streets, stopped being a street used by vehicles in 1979 when the council created the mall. The council also recommends lower Cuba St be transformed into a shared space for pedestrians and vehicles, with a speed limit as low as 10kmh. It would feature super-wide pavements for outdoor dining and street furniture. There has been considerable opposition to the proposal. A Save Manners Mall Facebook page has 4730 members, while two petitions have a combined signature total of more than 3300. The Wellington man campaigning to stop a plan to run buses through Manners Mall, has had his High Court case to halt the proposal thrown out. Benjamin Easton, a beneficiary, could not come up with $8000 to show he could make a contribution to the legal costs of Wellington City Council in the event that he lost his case against the council. He had until last Friday to pay the money or show how it could be paid. His application for an injunction against the council has now been struck out. Im failing to see how is this at all news worthy? A half a meter increase in the size of the road affects nothing. You’re probably right, it’s not that much. But if the two-way-ness of teh road is marginal anyway, then it may have an effect. One thing for sure is that the Trams that used to run through there are a lot skinnier than the buses they are proposing to put through. But if you get run over by a Tram or a Bus, the overall effect is going to be pretty much the same….